Currently operational in pilgrimage towns such as Tirupathi, Thiruvannamalai, Guruvayur and in Hyderabad (Gachibowli), the company is now entering into the world’s largest railway network. The FreshUp centre at Kachiguda railway station. Hyderabad: Chennai-based Fresh Minds Services has set up its first centre in collaboration with IRCTC, extending its services specifically to train passengers inside the station at Kachiguda Railway Station. Currently operational in pilgrimage towns such as Tirupathi, Thiruvannamalai, Guruvayur and in Hyderabad (Gachibowli), the company is now entering into the world’s largest railway network. FreshUp facility could be used for a short stay through simply pay by the hour concept i.e flexi pay and enhance the overall travel experience in Kachiguda Railway Station at a starting rate of Rs 149 per hour. FreshUp is going to open its second centre at Udupi Railway Station next month. 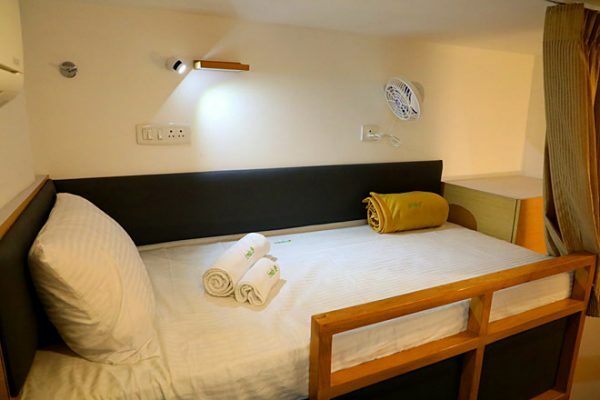 Pioneering the all new ‘Pay As You Use’ concept in India through its existing centres, FreshUp aims to revolutionise lodging for travelers and has been giving their customers luxurious stay on flexible hourly packages (one, three, nine, 18 and 24 hours). FreshUp centres will soon be coming up in airports, bus stations and more railway stations as well, providing the travelers a space to freshen up and refresh themselves while they are on transit. With an aim to offer travelers a space to freshen up while they are on the move, FreshUp provides travelers access to services such as 24-hours check-in and check-out pay as you use stay facility with services like round the clock hot/cold shower facility, toiletries, internet, luggage drop facility, coffee on hourly basis. Visitors can book the facilities online by logging on to the website www.freshup.space or by using the FreshUp App available in Google Play Store.